Harold is IN the OVEN! Wooo! 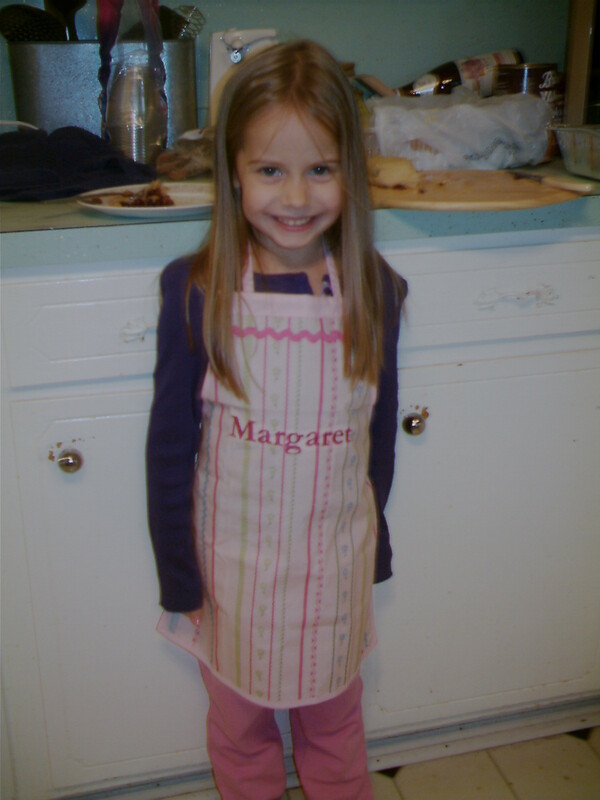 When my littlest was teeny tiny she LOVED to be in the kitchen with me. She has helped me with every Thanksgiving turkey since she was three years old! 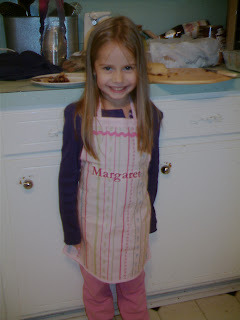 ﻿Isn't she adorable with her little apron? Her aunt bought that for her and she wore it out. I have it tucked away in a chest with other cherished items that she has temporarily outgrown. I know when she is older she will be glad to get them all back. Every year I do the same turkey recipe. Wolfgang Puck's Brine Roasted Turkey. It turns out the perfect turkey, EVERY time. And after eleven years of not so good turkeys, it is a real treat. Just now we were in the kitchen together, I was chopping the garlic and she had just started chopping the sage for the butter when the room instantly smelled like Thanksgiving and Christmas all rolled in to one. I looked over my shoulder at her and there she was, as tall as I, using the big-girl knife, and smelling like a holiday. The past eight Thanksgiving mornings flashed before my eyes and I burned another memory right into my spirit. The special place where you keep all the very best ones. And I am so thankful. She's gone back to bed for now. She will help me again in a few hours with the Best Damn Dressing ITW, and the potatoes, green beans, sweet potato casserole, and everything else. And everyone else will be up and music will be playing and we will be laughing and I will stress a little and they will make me laugh again and it will be a great day. But there is something special, almost sacred, about preparing the turkey with my youngest and getting it in the oven in the quiet of the morning. I hope you have a wonderful Thanksgiving; and remember that giving thanks can be done every day, with or without a Harold!